At this anchor outpost of the Momofuku empire, Matthew Rudofker chars his broccolini and serves it with slivers of hot-smoked, koji-cured beef tongue and wedges of tea-brined egg. Then, because nobody ever says no to more umami at a David Chang restaurant, the kitchen blankets it in shavings of manchego cheese. There’s some smart, often inventive cooking hiding behind all that well-deserved burger hype at this cozy Bushwick restaurant. 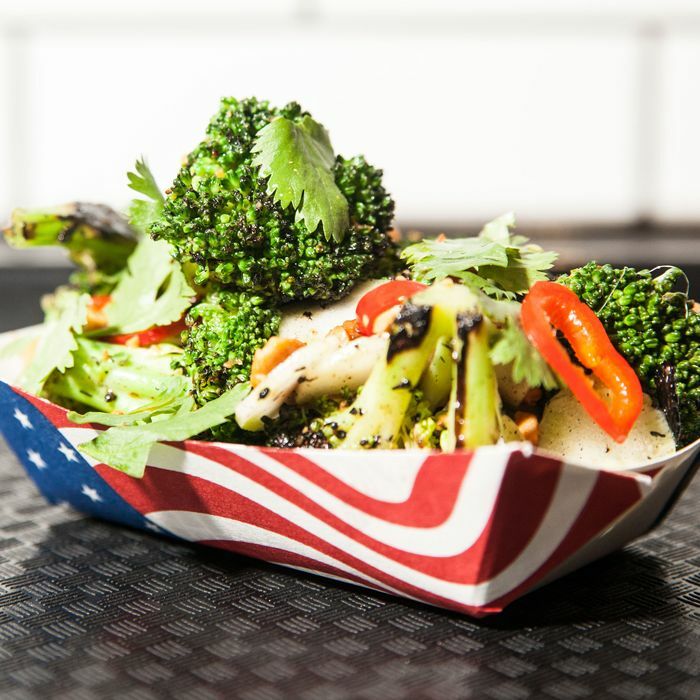 Dan Ross-Leutwyler’s food is recognizably American with subtly smart, chef-y tweaks, like this East-meets-West bar snack of beer-battered broccoli — always crisp, never bready — with a sticky, sweet, spicy dipping sauce that’s inspired by Thai hot sauces. 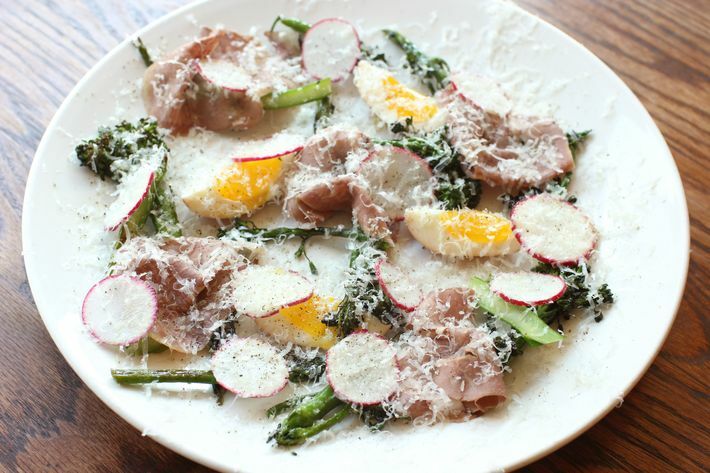 Roberta’s may be known the world over as a destination pizzeria, but regulars know to pay heed to the kitchen’s creative, consistently delicious vegetable-focused dishes. Consider this number, which pairs crunchy kohlrabi and broccoli, some of it charred to a satisfying, blackened crisp, with the traditional Piedmontese anchovy-based dip bagna cauda deployed as a seasoning. Ex–Del Posto pastry chef Brooks Headley’s tiny basement space is the nexus of the veggie-burger movement, but it’s hardly a one-hit wonder. For this unexpectedly savory, refreshingly acidic salad, his kitchen burns broccoli and lets it star among a cast of cilantro, smoky puréed eggplant, and sliced red chili. Ralph Lauren’s clubby Upper East Side restaurant is tough to penetrate, but once one does, one sees that the menu is all about (surprisingly) well-executed basics: lobster rolls, hamburgers, pigs in a blanket, and so on. The charred broccolini is predictably un-fussy, but even Lauren seems to know there’s something stylish about this often-overlooked green. At his rustic seasonal East Village restaurant, Marco Canora gives savory Italian custard a bitter note with puréed broccoli, then serves it with wild-boar cacciatorini, anchovy, and fruity Calabrian chili on the side. Dan Barber’s crusade against food waste continues, and he’s teamed up with salad chain Sweetgreen for the latest phase. Through September 28, all of Sweetgreen’s New York locations are serving a collaborative WastED Salad made with various vegetable trimmings and “off cuts,” including carrot ribbons, romaine hearts, and — most important here — broccoli leaves and crunchy stems. At Andrew Carmellini’s pasta-and-small-plates spot on the Bowery, the staff serves grilled broccolini with feta for tang, breadcrumbs for crunch, and a housemade version of the sensational spicy spread known as Bomba Calabrese. Made with garlic, pepperoncino, and basil marinated in olive oil and white-wine vinegar, it’s a perfect foil for broccolini.